TIGARD — They've got leadership. They've got smarts. And they also look to have a lot of other factors going for them. 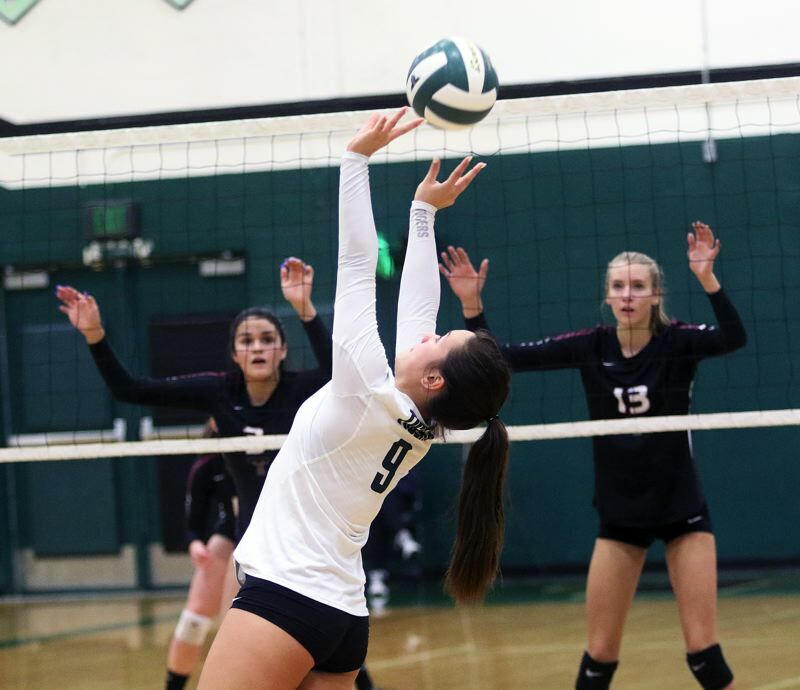 With all of that, the Tigard Tigers are taking an optimistic view into the 2018 high school volleyball season. "Strong," second-year Tigard coach Megan Norris said of the team's outlook going into the 2018 slate. "It is impressive group of girls in terms of work ethic, integrity, caring for others and the desire to win. I think we have the opportunity this season more than ever to surprise good teams." The Tigers look to have a solid group of returnees from last year's squad that finished in sixth place in the Three Rivers League standings at 6-10, while going 7-14 on the season. Among those returnees is senior libero Maddie Hoover (5-foot-3). "We have many returners and upperclassmen which gives us strong leadership," Norris said. "Maddie Hoover is a returning libero for us and she will be a major factor in the success of our defense this year." Also returning are senior setter Avery Kim (5-4) and sophomore outside hitter Ali Dreves (5-10). "We are competitive with each other in practice and our players are strategists," Norris said. "Two of our strongest strategists are our senior setter Avery Kim and returning sophomore outside hitter Ali Dreves." Other returnees for the Tigers include senior right side Nicole Mazzeo (5-6), senior defensive specialist/libero Kathleen Xiong (5-5), sophomore setter/right side Kennedy Peery (5-8) and senior right side Hailey Bigej (5-10). "We are a very smart team," Norris said. "Our program (grade-point average) last year was 3.9. This shows through in the way we will play as well as the way the team handles problems and works through them. Some of our smart leaders who make a big impact in ways you might not always see are Hailey Bigej, Nicole Mazzeo and Kat Xiong." Among the varsity newcomers for the Tigers is freshman outside hitter Kaitlynn Peterson (5-7). "She has strong skills and solid communication," Norris said. "She plays with the mindset and maturity of a more experienced player." Senior Mikayla Hall (5-8) also joins the Tigard varsity this year. "She is a senior who outworks everyone and will make appearance on both the right side and in the middle for us," Norris said. Other newcomers to the varsity include senior middle blocker/outside hitter Alicia Vandervoort-Walters (5-9), senior middle blocker Meqkylih Smith (5-11) and sophomore outside hitter/right side Erin Bullard (5-5). "Our middle blockers this year, Kylih and Alicia, have a raw talent and athleticism and they are making great connections on their blocks and in their attacks. I think they both have the ability to surprise people," Norris said. "We have some strong setters, and a question mark is still whether we will run a 5-1 or a 6-2 with our setters. Avery Kim is a strong leader as the veteran setter but there are options where our younger setter, Kennedy Peery will have opportunities to hit in the front row this year." The Tigers are hoping it all adds up to success in the powerful Three Rivers League. "Our league is incredibly competitive," Norris said. "I think, all season long, our league will be a battle and no one is safe and no one is a guaranteed win. Our goal this year is to win many of those battles and finish strong in the top four of the league." And, the Tigers aren't looking at success just this year, but also in the future. "It is my second year as head coach and I think Tigard is headed in the right direction," Norris said. "I have amazing coaches here. We have a new JV coach, Nancy Wittgow who played at Gonzaga and has coached overseas, a returning JV2 coach, Emma Adams and a new JV2 assistant, Hannah Coursolle, who is a Tigard alum. All of them are really pushing the athletes to work hard and continue to improve. The girls have really accepted our vision for the type of team we want to be and the culture is really shifting towards the hard work and integrity that we aspire for. I think the future looks good for Tigard volleyball." The Tigers will open their Three Rivers League schedule Tuesday, when they play at Tualatin at 6:30 p.m.